Sometimes in legal technology, when it rains, it pours. In April, I wrote here about Rocket Matter Intake, the new service from Rocket Matter that allows law firms to post client-intake forms on their websites that integrate directly with its practice management platform. A few weeks later, I wrote here about Lexicata, another client-intake system with more features and configurability than Rocket Matter Intake. As I noted then, there is a third option: Intake123. What each of these products have in common is that they allow law firms to create online forms for lead intake and new-client intake. The forms reside online where potential clients can fill them out in advance of a consultation or even while sitting in your waiting room. They can also be used to gather information from visitors to your website making inquiries about your services. The information they provide on the forms can be sent directly to a practice management system. Rocket Matter Intake sends the information to Rocket Matter, Lexicata and Intake123 both integrate with Clio and have plans to add others. At the same time, each of these three products differs from the others in notable ways. Rocket Matter Intake is the least configurable. It is designed to work only with Rocket Matter. Its forms must be set up by Rocket Matter staff, who build the forms according to your specifications and map their fields to corresponding fields in Rocket Matter. Lexicata is broader in what it seeks to do, aiming to manage the entire client-intake process, from initial contact to signing a retainer. Besides allowing firms to create intake forms, it includes tools and alerts that allow firms to keep on top of new-client intake and an e-signing capability to complete engagement letters. In comparison to these other two products, Intake123 most stands out for its robust form-creation tools. It is preloaded with hundreds of drag-and-drop templates that firms can use to create intake forms and engagement letters. Law firms can create forms using any combination of the templates and modifying any of the templates. If a firm prefers to create a form from scratch, it can easily do that as well. 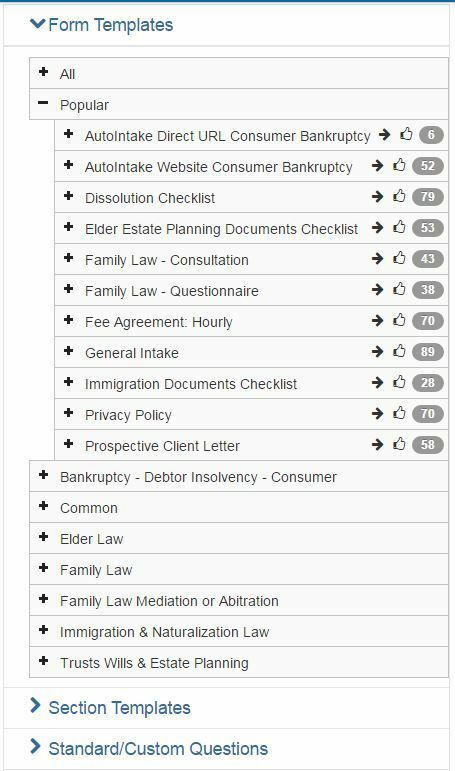 Intake123’s templates provide forms for common practice areas such as family law, bankruptcy, immigration, and trusts and estates. The form designer also includes templates for common form sections, such as contact information, employment history, financial statements and parties. It even has a number of individual questions ready to use, covering items such as car expenses and closest living relative. Many of these standard questions are linked to fields in Intake123’s database so they can be filled in automatically. The left panel expands to show more specific templates. Any item can be dragged and dropped onto the form designer. Anywhere in a template, you can also create your own sections and questions. Once you create a section or question, Intake123 saves them for you to use on other templates. The designer includes the ability to add “objects” to a form. These can include logos, images, a signature or your letterhead header. Once you are done drafting a form, you have to “activate” it. That locks the form in order to protect the integrity of its fields within Intake123’s database. However, you can always create a new version of the form from the locked form. There is no limit to the number of forms you can create on Intake123. Forms created using Intake123 can be embedded on your firm’s website to capture leads or sent to prospects via a private URL for intake in advance of an initial office visit. If a firm prefers to have new clients fill out the form in the office, a staff member can have the form queued up on a tablet or laptop. Another workflow is what Intake123 describes as AutoIntake. This would be where a potential client begins by filling out a form on your website. The information is automatically entered into Intake123 and the designated forms are automatically sent out. You receive a notification of this activity and can follow-up to schedule an appointment. Alternatively, instead of publishing the form on your website, you can send the potential client a direct link. Intake123 includes an e-signature function that allows clients to sign forms electronically and then locks them once they are signed. All of the information entered through Intake123 can be synchronized with Clio. When this is enabled, Intake123 takes the information entered on a form and automatically creates a new contact and matter in Clio. Any information subsequently entered through Intake123 is also synchronized with Clio in real time. The company plans to enable integrations with other practice management platforms as well. Overall, I like Intake123 and would recommend it to any firm wanting a robust tool for creating intake forms. My one criticism of it is that it can be somewhat confusing and cumbersome to use at first until you have worked with it a bit. The reason for this, in large part, is that it offers so many options for creating forms and workflows that understanding them all can take time. The first time you log on, a new-user wizard walks you through the process of setting up Intake123 and customizing it to your preferences. The wizard is helpful in getting you started. There are a number of training videos that cover specific aspects of designing and managing forms. Live chat is available to answer questions. I did not test this but the chat icon appears on virtually every page of the site. Help-desk tickets can be submitted to ask questions, report bugs or suggest features. I always prefer sites to have some written documentation. The videos are informative but I found myself having to revisit some of the videos multiple times to find answers to simple questions. Written help files would make it easier to find answers to routine questions. Silver for $9 a month, which allows one active form and 10 intakes a month. Gold for $25 a month, which allows five active forms and 30 intakes a month. Platinum for $39 a month, which allows 10 active forms and 75 intakes a month. Enterprise for $79 a month, which allows unlimited forms and intakes. It also offers a 30-day free trial so you can try it out for yourself. Of the three client-intake products I’ve looked at — Rocket Matter Intake, Lexicata and this — Intake123 is best for firms that want a robust tool for designing and customizing intake forms. Its preconfigured, drag-and-drop templates make it easy to create professional-looking forms for clients to complete via the web or on a device in your office. Intake123 lacks the analytics, alerts and CRM features that Lexicata includes, whereas Lexicata lacks the preconfigured templates of Intake123.